North America Railway Management System Market value in 2017 was projected to be over 9 billion and is anticipated to reach over USD 17 billion, growing at a CAGR of more than 10% over the forecast timespan. 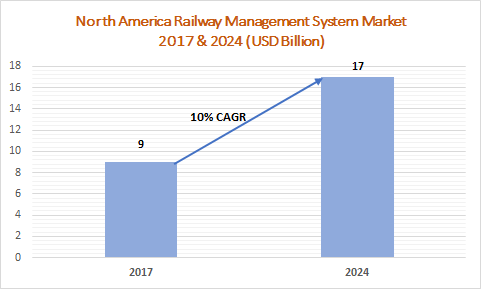 The North America railway management system market is growing due to rapid digitalization, stringent government regulations, and technological advancements in the fields of IoT, cloud computing, and big data analytics. These advanced technologies are assisting railway operators to offer enhanced passenger services across all departments including signaling, maintenance, ticketing, onboard experiences, and communications. They offer various benefits such as smart traffic control, inter and intra train communication, and improved passenger assistance, fostering market growth. Various rail operators functioning in this region are launching new solutions and services aimed toward seamlessly connecting passengers with railway infrastructure, delivering an enhanced experience. For instance, in November 2018, Bay Area Rapid Transit (BART) launched its official applications to offer riders with an enhanced experience across stations and on trains. This application is designed to provide real-time service interruption information and navigation guide, improving passenger safety and traveling experience. The rail traffic management system dominates the North America railway management system market with a share of over 26% in 2017. These systems deliver permanent control across the rail network, log train movements, and set routes for trains. They also provide a centralized management system for monitoring the power supply facilities, driving their adoption in the market. The centralized traffic control solutions hold over 43% of the share in the North America rail traffic management system as they augment the efficiency in transport regulations, increase the transport capacity, bring about better rail coordination, and reduce maintenance & operational costs. The U.S. leads the North America railway management system market due to an increase in the use of smart incident management systems to detect, respond, and clear traffic incidents. The companies operating in this region are engaged in strategic mergers and acquisitions to extend their product offerings and provide augmented solutions to their customers. For instance, in August 2016, GE acquired ShipXpress, a supply chain software provider to expand its digital railway offerings. This acquisition enabled GE to offer scalable advanced cloud-based solutions providing railroad customers with improved information and service. The North America railway management system market is extremely competitive due to the presence of various regional and multinational players including Computer Science Corporation, DXC Technology, General Electric, IBM, Sierra Wireless, GAP RFID, Bombardier, and Trimble. 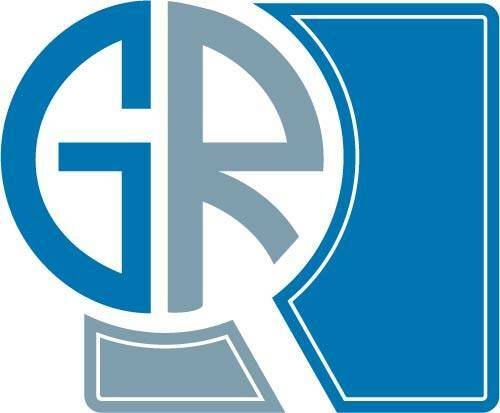 These companies are global leaders in the railway management system market with a comprehensive product portfolio, making further investments in R&D to develop innovative solutions and meet the market demand.